To the beauty of the town and its surroundings, we must add excellent infrastructures in terms of communications. Currently Baiona is connected by highway not only to Madrid, but to the main Galician and Portuguese cities. All this, together with the hospitality of its people, and its renowned gastronomy make Baiona an ideal destination for your holidays. 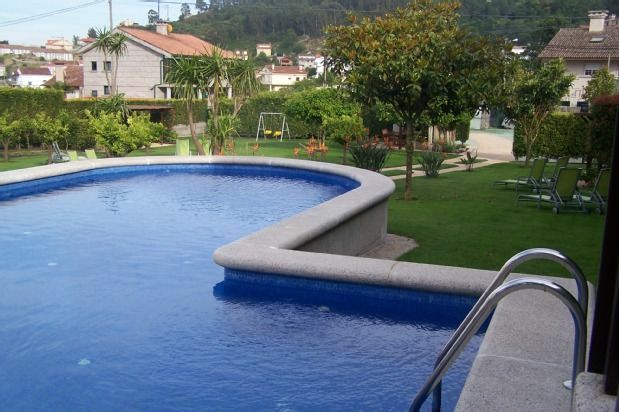 The Ababides Apartments have been located in an estate of about 3,000 square meters with a well-kept garden and ample parking, combine the tranquility of the countryside with the proximity to the center of Baiona and its beaches, where only 250 meters separate us. and 700 meters respectively. The garden: • Upon entering the entrance, a well-tended garden on two levels will welcome us. We can enjoy tall trees such as camellia, holly, magnolia or even avocado. We have a collection of orange, mandarin and grapefruit. Two striking palm trees and multiple estrelitzias confer a tropical atmosphere. • A rich variety of shrubs and smaller plants provide a note of color. And there is no shortage of climbing plants such as jasmine and passionflower, or aromatic ones such as thyme, rosemary and lavender. • On the lawn we have comfortable chairs to match the environment. The gazebos and terraces are equipped with teak furniture. • In the upper part of the garden we incorporate a laundry area, and in the lower part we have a pool with water heated by solar panels installed in the parking lot at the back of the garden. Forget about the car: • In the lower part of the enclosure we have a large parking lot. • We have located a group of solar panels, which in addition to providing a pleasant shade, fulfill the task of providing hot water to the apartments, heating the pool, and providing heating in winter to some apartments. • The parking lot, as well as the rest of the enclosure, has excellent lighting throughout the night. Additionally, this video surveillance. • It has direct access to the outside to avoid the maximum circulation of vehicles in the vicinity of the garden. Laundry facility: • In order to avoid humidity and noise in the apartments, we have arranged a specific corner so they can wash their clothes if the need arises. • We have washing machines and dryers. We also provide detergents and softeners free of charge so you do not have to worry about anything.